5.11 Tactical® originated the concept of the tactical pant. Originally designed and sold by Royal Robbins as utilitarian pants for mountain climbers, they were adopted by the FBI Training Academy in 1992. The name 5.11 comes from the rating system used by mountain climbers to rate the difficulty of climbs, with 5.11 being the most difficult at the time. With its new Defender-Flex jeans and pants, 5.11 set out to reinvent the tactical pant. The Defender-Flex line was developed by 5.11 to meet the needs of end-users looking for low-vis tactical without sacrificing performance. They have a casual look that blends in and hides their tactical lineage. Although tactical clothing draws less attention these day because their practical attributes have made them quite popular, and not just with the tactical crowd, they are more likely to be noticed by a bad actor. The whole concept of the gray man involves blending in with the crowd, not drawing undue attention, and masking one’s skills and weapons. Stylish jeans and pants, such as the Defender-Flex line, blend in any place that casual attire is appropriate. 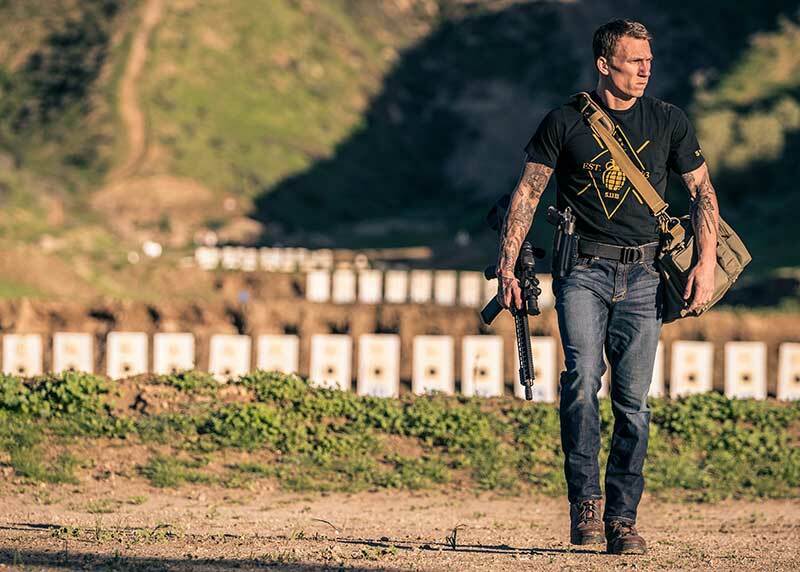 Although they aren’t the first low-vis tactical jeans and pants to hit the market, the Defender-Flex line features a combination of innovative design, advanced fabrics, and classic styling that set it apart from others. It’s also available at a significantly lower price point than other low-vis tactical clothing. The Defender-Flex line is available in men’s straight and slim fit. Women’s Defender-Flex Slim Pants are also available, as well as women’s Defender-Flex Jeans in boot-cut and slim fits, and in dark, medium, and light color washes. 5.11 provided me with a pair of Defender-Flex Straight Jeans and two of the Defender-Flex Straight Pants for evaluation. A major difference between the Defender-Flex line and standard jeans and chinos is the fabrics. Defender-Flex Jeans are constructed of 10-ounce denim with LYCRA® T400® Tough Max® technology, a cotton/polyester blend (76% cotton and 24% polyester) fabric that is twice as strong as 100% cotton, with a higher tear and tensile strength, as well as greater abrasion resistance. The Defender-Flex Pants use an 8.8-ounce Cavalry Twill fabric, consisting of 66% cotton, 31% polyester along with 3% elastane (elastic polyurethane) for stretch. The Cavalry Twill features a soft fade finish and enzyme washed fabric. The jeans have a slightly softer feel than the pants and have less stretch. Other than the fabric and color options, the jeans and pants are identical. The Defender-Flex line features double-needle construction with bar tacks in high-stress areas. There are eight belt loops and a fitted waistband. The belt loops are sized to fit up to a 1¾-inch belt. The pants have a button-top fly with locking YKK® zipper. The button (and brass rivets on the men’s jeans and pants) are emblazoned with the 5.11 logo. The women’s pant lacks the rivets for a more feminine look. 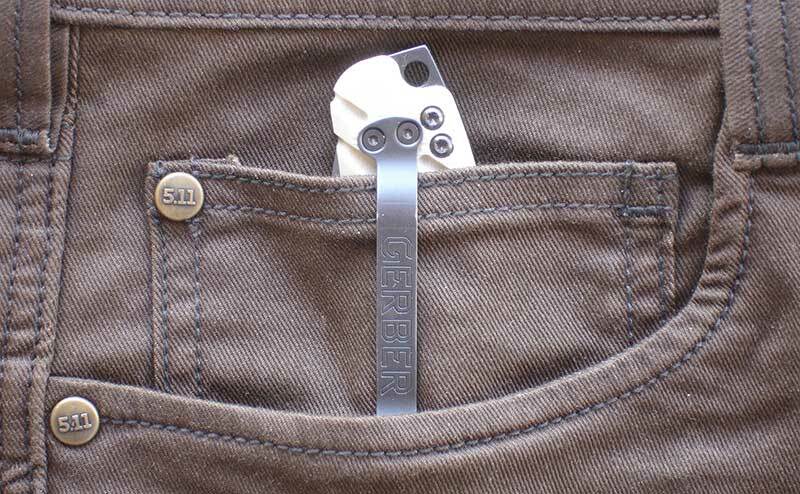 Gerber Propel Auto in right-side coin pocket on men’s Defender-Flex Pants. The Defender-Flex line features traditional five-pocket styling (six pockets in the case of the women’s pant) with the addition of two hip mag pockets, for a total of seven pockets. The hip-pocket pouches are designed to hold 30-round AR magazines. The right-side coin pocket on the men’s jeans and pants is deep enough to hold a pistol mag, folding knife, tactical flashlight, smartphone, or even a tourniquet. The coin pocket is omitted on the women’s pant and is replaced by two welted device-ready pockets. The other pockets are fairly standard jeans pockets. Both the jeans and pants are exceptionally comfortable, and the flex allows for a freedom of movement not found in regular jeans. The stretch in the waistband provides the ability to carry a pistol comfortably in an inside-the-waistband holster without requiring a larger size. The construction and workmanship on the samples provided appear excellent. Although I haven’t worn them long enough to accurately gauge the durability, given the quality of the materials and construction, I have no doubt they will prove very durable and long-wearing. Defender-Flex line features traditional five-pocket styling (six pockets in the case of the women’s pant) with the addition of two hip mag pockets, for a total of seven pockets. 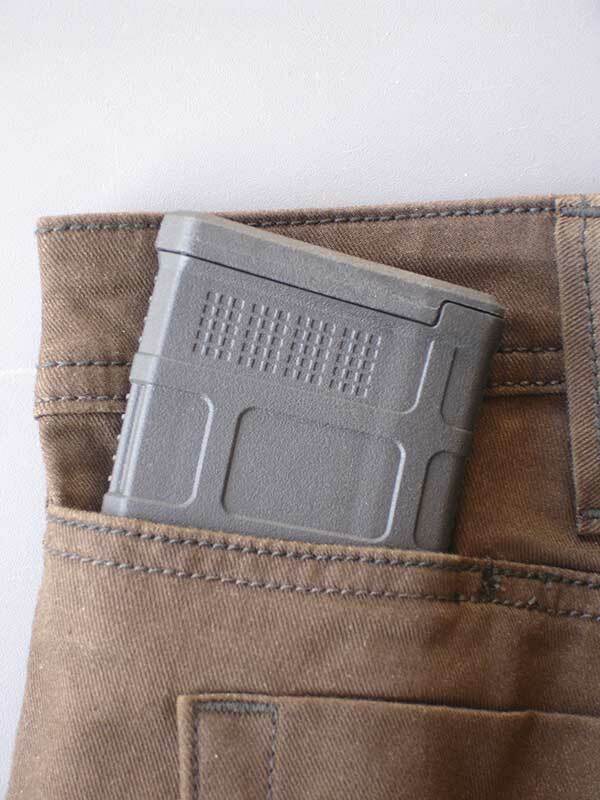 Hip mag pockets are designed to discreetly hold 30-round AR magazines, such as this Magpul PMAG. One thing to note is that the jeans will bleed. This issue is not unique to 5.11 Defender-Flex Jeans, but is due to the dyes used in coloring blue denim and is common with all blue jeans. Heed the washing instructions on the inside label. Before wearing, wash them several times alone in cold water. Always turn them inside out when washing, and wash them with other dark clothes. The Defender-Flex Straight Jean and Slim Jean are available in Indigo and Dark Wash Indigo. The Defender-Flex Straight Pants and Slim Pants come in Volcanic, Stone, Burnt, and Oil Green. The Women’s Defender-Flex Slim Pants are available in Red, Volcanic, Stone, and Thyme. The Defender-Flex line is GSA/TAA compliant. Suggested retail prices vary from $34.49 to $69.99.